Lemonade is a summer-time favorite at family dinners and cook-outs, and this lemonade recipe for kids will please the younger crowds too. 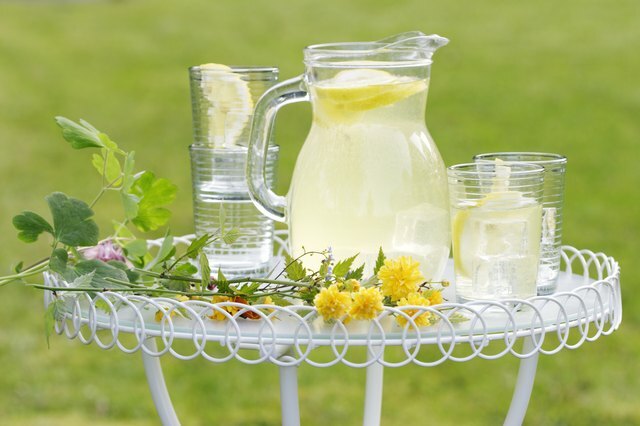 Sweet lemonade presented in a glass pitcher and served in pretty drinking glasses makes the occasion more special. Make homemade lemonade using lemon juice from concentrate, which is made from the juice of real lemons and bottled without sugar. Use the right combination of water and sugar with the lemon juice for a pitcher of refreshing lemonade with flavor balanced between sweet and tart. 1. In a pitcher, add the lemon juice, water and sugar and stir until sugar dissolves and the liquids are fully combined. 2. Using the heel of the hand, roll the lemon across a counter top to soften and loosen the juice, and use a knife to remove the ends. 3. With a sharp knife, make as many thin lemon slices as possible. 4. Add the slices to the pitcher, which contribute a fresh flavor, aromatics and an appealing, natural visual appearance to the lemonade. 5. Serve the lemonade over ice in a tall glass and garnish with a mint sprig. 6. Alternatively, dress up the serving glass with a fruit garnish on the rim. A strawberry or orange slice sits well and provide a last bit of edible surprise. The concentrated, frozen lemonade drink sold in 12-ounce cans found in the freezer section of your grocer contains sugar. 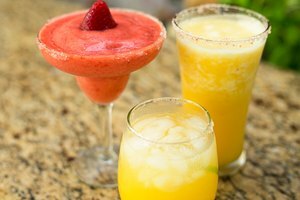 Frozen lemonade, which is an add-water-and-mix drink, is not reconstituted lemon juice, which is sold in bottles and in the small lemon-shaped plastic containers found in the produce section. Many reconstituted lemon juice products are made from lemon juice concentrate, filtered water and lemon oil. Preservatives often are added, but no sugar. Three tablespoons of reconstituted lemon juice equal the juice of one lemon. Use an alternative sweetener or a sugar substitute instead of refined sugar. Look for conversion information, such as how much aspartame or agave equals 1 cup of sugar, on the manufacturer websites or the product packaging. For a mixed spin on lemonade with natural sugars, add a small proportion of 100 percent fruit juice such as pineapple, orange or pomegranate. 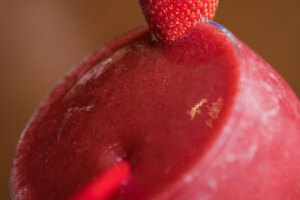 Create a fruitier lemonade with pureed fruit, such as peaches, raspberries or blueberries. Replace 1 cup of water with cranberry, orange or grapefruit juice. Be sure to adjust the sugar based on the type of fruit you add. Make ginger lemonade with peeled, thin-sliced ginger root boiled for about 15 minutes with the lemonade ingredients and allow the lemonade to chill for an hour. Garnish with a small piece of candied ginger on the glass rim. Mix the sugar in one cup of hot water to dissolve the sugar quickly and thoroughly. If you use this tip, add only five cups of cold water to the pitcher. Cover the pitcher and refrigerate the lemonade until you're ready to serve. This will ensure the lemonade stays fresh and does not absorb the aromatics of other foods in the refrigerator such as onions or garlic. To stave off bitterness, add a pinch of salt to the lemonade if the lemonade has a strong aftertaste. This tip will help to balance the flavor profile of the lemonade.